Japan is country that has always stood out for its advanced technologies, workaholic society, and their amazingly healthy population. Like seriously, Japan is a really healthy country. Their life expectancy is a staggering 84 years, compared to America’s 76 years. Japan has given a lot to the world. Pokémon, Sony Walkman, Nintendo, Robots, Digital Camera and some mind blowing secrets to healthy living. People in Japan live up to 100 years without considering it an extra ordinary feat. What is truly amazing is how the Japanese women stay slim throughout their lives, and never seem to age. Their striking, porcelain skin that seems to never have aged is a thing of beauty. But how do they manage it? What is it they do that allows them live achieve what would be every woman’s dream? Well, we’ve got you covered. This is like the most obvious reason. Food plays a very important part in our health. The Japanese women eat better food than the Americans. While Americans want food portions that are worth their money, Japanese are easily satisfied with food portions that might be mistaken for a child’s meal here. And it’s not just how much they eat, it is also WHAT they eat. They enjoy a home cooked meal on a daily basis, as compared to regular take out. A typical breakfast could include a small serving of steamed rice, miso soup with tofu, sheets of nori seaweed, an egg omelette or piece of fish, and a cup of green tea. They include a cup of green tea with almost every meal, racking up those antioxidants. Plus, green tea has been shown to aid in weight loss. The Japanese consume almost 10 percent of the world’s fish. This daily dose of omega-3 fatty acids may well explain why they live long and healthy lives. That, and the fact they consume 5 times the amount of cruciferous vegetables, broccoli, cabbage, kale, cauliflower and Brussels sprouts, that Americans do. 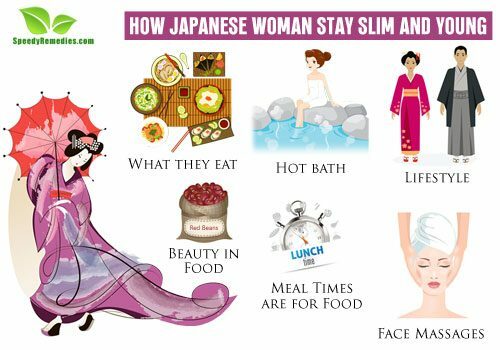 A lot of reasons why Japanese women and the entire population in general lives such a healthy life can be attributed to their lifestyle. The Japanese lifestyle is built in a way that promotes exercise. Not the kind of exercise where people pump their bodies in a gym, but the kind where you are exercising without even realizing. A lot people walk or cycle to their destinations rather than drive to it. It’s because the country’s infrastructure isn’t built in a way to support driving everywhere. People usually use public transport to reach their destination, which means having to walk to the nearest station.With so much walking or cycling going on, is it a surprise that they remain so slim. Who knew that the thing to change your lives and fulfill your dreams would be a hot bath. The Japanese take their bath seriously. Just ask anyone who has been to a Japanese public bath house. A hot bath calms you down, relaxes your muscles and naturally improves the blood circulation. Taking a hot bath at least twice a month cleanses your skin and improves digestion. But it isn’t enough just to have a hot bath. It is imperative that you get the temperature and the level just right. Japanese women get the water level to the level of the heart; the ideal temperature being between 100? – 104 ?. The American society is a champion of individualism and non-conformity. Americans are confident of their uniqueness and take pride in standing out. Which is why being a fat person in America is nothing weird. They do not feel as if they are alienated from the society. So whenever someone points out that you are fat, you feel hurt rather than take advice and do something about it. Japanese society is more about conformity and fitting in. There is an immense pressure to be healthy in this society. Therefore many women become self conscious about their weight and do everything to control it. Basically, the horror of being unhealthily fat strikes Japanese earlier than their American counterparts. In Japan, you do not do anything else while eating. No TV, no work. Families gather around a table on which a variety of dishes are spread all over, to compensate for the quantity of food and to provide varied nutrition. Cleanliness and presentation of food too form an essential part of Japanese food eating. They also eat slower, giving their stomach to process food and signal their brains that it is full. Chopsticks actually play a role of hindering the amount and speed at which people intake food. Slower eating means your stomach has time to tell you ‘enough’, compared to the speedy binge eating of Americans where it’s already too late by the time your stomach is able to process food and signal you, resulting in over eating. Women in Japan indulge regularly in face massages, both in spas and at home. It prevents premature aging and improves blood circulation to the face. If you are too lazy to put in the effort, you could try using a face brush to the work. Facial oils are very popular in Japan as they contain vitamins and are good at keeping toxins out while retaining moisture. Using food ingredients to naturally enhance beauty is an old age tradition in Japan. Women use red beans known as Adzuki to exfoliate and brighten up their skin. Applying this mask gently can rid your skin of blemishes. Vitamin C also forms an important part of Japanese women’s beauty routine. Adding vitamin C to your diet helps to break up melanin and remove pigmentation which means you get an even complexion. Fish, which is staple in their diets, provides them with a glowing skin along with other health benefits. Green tea also greatly benefits the body. Racked up with antioxidants and anti-inflammatory elements which keeps the skin younger looking, Japanese women also apply it directly to their face to treat acne.